I teach Kindergarten at FLVS. I know, teaching Kindergarten VIRTUALLY sounds nearly impossible. So, here’s how it works. 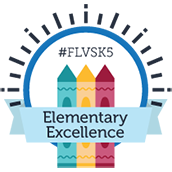 Most of our FLVS Flex Elementary students are homeschool students. They register with FLVS for curriculum support and we meet with them twice a week in our virtual classroom for live lessons. Not only are we a teacher for our students, we are a partner with the home educator, which is often the student’s mom or dad. It’s a great option for families who want to homeschool, but also want a classroom experience and the support of a certified teacher. I meet with my students in our virtual classroom every Tuesday and Thursday morning for Language Arts, Social Studies, Math, Science, and Technology. This time in our virtual classrooms is my absolute favorite time throughout the week. We use Blackboard as our learning platform and the students can see me and their classmates as we work through interactive lessons together. The students may also do specials like PE, Art, and Spanish. If they choose an elective, they have additional coursework and class times with their teacher. The rest of their time is spent on independent work at home. Our students log into their student dashboard and work through their lessons for the week. They have a weekly planner that keeps them on track and shows them which lessons they should be working on for each subject, but they have the flexibility to move those lessons around during the week as they wish. They can also choose to take just one course or all courses with FLVS. In their lessons, some activities are done right there on the computer, but many require them to get off the computer, too! They print activities and then submit those to their gradebook for teacher grading and feedback. The students also have access to skill development programs that allow them to review or go beyond the learning covered in their lessons. So, what am I doing while my students are busy doing all of that? I’m on the phone with parents, monitoring student progress in their skill programs, grading student work submissions, planning our live lesson activities, and meeting with my students for extra support if necessary. I also attend grade level meetings, faculty meetings, PLC meetings, and any other meeting a brick-and-mortar teacher would attend (they just happen on my computer while I’m in my yoga pants). Even though our students are virtual school students, they still have access to everything a student in a brick-and-mortar school would. We have morning announcements, guidance, and even clubs! Obviously, these things take place in virtual settings, but the students have the chance to collaborate with others to extend their learning. We have special events like Literacy Week, Spirit Week, Career Day, and a Vocabulary Parade. We have special visitors like authors and Jack Hartmann has come to “visit” us twice! We also have field trips throughout the year. We have locations across the state where families can come and be with other FLVS elementary families. Then, at the end of the year, we have one big field trip in Orlando where we all come together! These are special times for us to be with our students in the physical world. It’s funny because they are often a little shy when we first meet them in person, even though they’ve seen us all year. They do eventually warm up and we have an awesome time together. At one point I felt like a Disney character because I had a line of little faces waiting to meet me. We also value learning that takes place off of the computer. We do science experiments, go on nature walks, do arts and crafts, sing, dance, dress up, READ, and pretty much anything else a brick-and-mortar student would be doing in a Kindergarten classroom…even centers! We also have brain breaks during our live lessons where we will get up and dance to a fun song (enter Jack Hartmann). We use movement throughout our lessons and certainly don’t expect our 5 and 6-year-olds to sit at a computer for two hours. We also incorporate community building in our classroom. We celebrate birthdays and have a student spotlight each week. I encourage my students to send me pictures of whatever they are up to so that I can share those in class and the kids can learn about each other. In Rita Pierson’s TED Talk, she quotes James Comer who said, “No significant learning can occur without a significant relationship.” I think of this often along with Rita’s quote, “Kids don’t learn from people they don’t like!” When I first switched from brick-and-mortar to virtual school, I thought there was NO WAY I would have the same relationships with my students. How could I? I could not have been more wrong. I have formed lifelong relationships with my students and their families while teaching at FLVS. Getting to work so closely with the parents in educating their child has been a very rewarding process. I get to be a champion (yes, Rita!) for not only the student, but also for the parents. 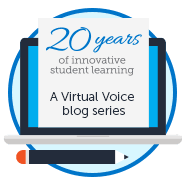 So, all in all, the platform we use is different, but the same thing that makes a great brick-and-mortar teacher also makes a great virtual one! We put students first and we love what we do! This entry was posted in Educator Edition, Homeschool Edition, Parent Edition and tagged A Day in the Life of an Online Teacher, Elementary Online, Elementary School, Elementary Teachers, Florida Virtual School teachers, FLVS Elementary, FLVS Flex Elementary, Homeschool with FLVS Flex, Kindergarten Online, Online Elementary School, Online Elementary Teachers, Online Teaching, virtual elementary, Virtual Elementary School, Virtual Elementary Teachers, What it's like to teach with FLVS on December 17, 2018 by Cara Piper. I love teaching virtually. You can really have an incredible relationship with students and parents. I am so thankful for this job and the kids.